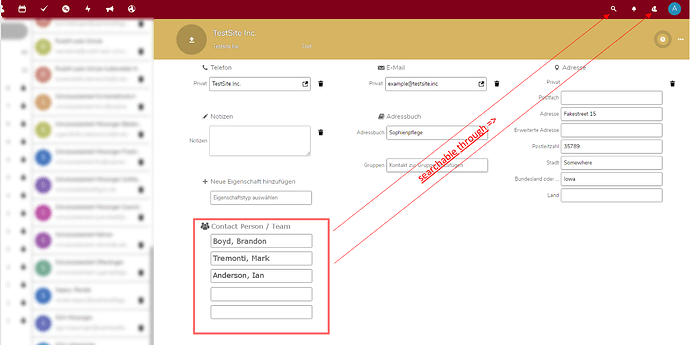 I´m looking for a way to add several contact persons to a single contact. 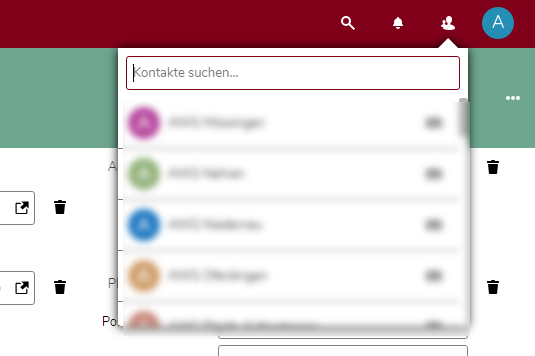 I tried to “cheat” by adding the Names to the “notes” field (via Outlook, then syncing), but the content of the “notes” field can´t be searched within NC (V15). Can you please describe the use case to better understand want you want to achieve? I´d love to see something like in this picture (red box) I built to better describe my question. I’m still not seeing an advantage of adding names without a specific purpose, but you should check if the “Related” (German: Verwandt) field is what you are looking for. You can add this field multiple times and change the relation to the contact, like “brother”, “sister”, etc. I´m trying to find a way for our staff to search for colleagues within the contacts and see, which branch / address they are working at. For that a branch or address is more of a fixed / static value, while staff often rotates within our institution, it would be useful (for me), if I can add them to an address somehow. More so for they often don´t have a personal mail address and / or phone number. Maybe my use case is too specific… But I´ll check out the “Related (Verwandt)” field…maybe that workaround will do for my needs…thank you for the hint! I agree with @j-ed (thanks for the help!! ), this seems very close to the RELATED field. What is the purpose of the data you’re putting on note? Indicate the link between this contact and other contacts? @skjnldsv I just tried to search for the content of the related field and can partly confirm that it isn’t found. I say “partly confirm” because if I search the main contact by entering e.g. its last name, select it once, delete the search criteria and then search for e.g. the first name of a related contact, the original main contact is found. Could it be possible that the related contacts are not indexed or search by default and only added “in memory” once the original contact has been open/loaded once? Do you think it would be worse to open an enhancement request to get these fields searched by default? @j-ed : I experienced the same behavior. Once the contact with the “related”-fields was selected and on screen, the overall NC search function can find it temporarily (the contacts search doesn´t). You mean not searched in the contacts menu, right? Not in the contact’s app search input on the blue header? After I selected a contact in the menu and see the details on the right, the overall search finds the “related” name(s) of the selected contact until the next logout/login. @AKoller Afaik, the so called “contacts search” is not part of the contacts app but is added by the Telephone Provider for ContactsMenu app. SO since we do not load all the data (only the shown contacts) for performance matters, we might have limited results.